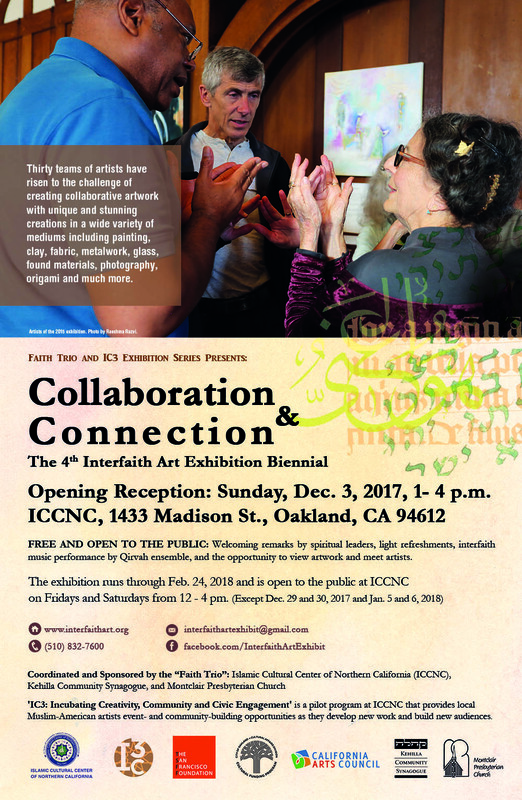 Opening Reception: Sunday, Dec. 3, 2017, 1- 4 p.m.
FREE AND OPEN TO PUBLIC: Welcoming remarks by spiritual leaders, light refreshments, interfaith music performance by Qirvah ensemble, and the opportunity to view artwork and meet artists. The exhibition runs through Feb. 24, 2018 and is open to the public at ICCNC on Fridays and Saturdays from 12 - 4 pm (Except Dec. 29 and 30, 2017 and January 5 and 6, 2018). Curated by Curatorial Panel, Lea Delson, Arash Shirinbab, Tom Delby, Robin Bernstein, Rubina Kazi, Steve McKiernan, and IC3’s curator and artist in residence, Minoosh Zomorodinia. 'IC3: Incubating Creativity, Community and Civic Engagement' is a pilot program at ICCNC that provides local Muslim-American artists event- and community-building opportunities as they develop new work and build new audiences. This program is made possible in part by the San Francisco Foundation’s FAITHS grant, the City of Oakland's Cultural Funding program, and California Arts Council's Cultural Pathways and Artists Activating Communities grants.